Shuktara is a popular children's magazine published from Kolkata, India. 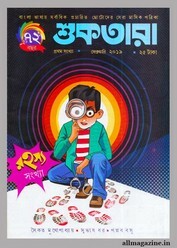 One of the most popular Bengali comics like Narayan Debnath's Batul the Great, Handa Bhonda, Bahadur Behal is published in this magazine. Lovely children, now I'm going to share Shuktara- February 2019 edition as pdf. This is a special mystery edition, there are a lot of mysterious stories by various writers in this issue. Collect the Bangla children magazine as a pdf file.